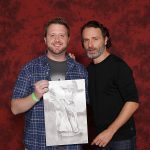 Matthew Atchley is a celebrity artist and actor known for his hand drawn, intricately detailed illustrations. His subjects span across all fandoms and different forms of pop culture, including characters from popular TV, film, comics, and more. 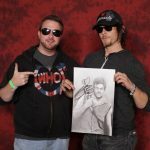 He has created artwork for several actors from The Walking Dead, Daredevil, Breaking Bad, Arrow, The Flash, Buffy the Vampire Slayer, Doctor Who, and Napoleon Dynamite, to just name a few. Ever diverse, he also created a series of political cartoons with actor Sean Astin. Matthew Atchley illustrated, with Sean the cartoons. 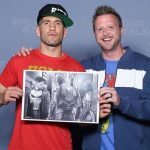 Matthew appears at comic conventions and events as a special guest all across the country. His artwork has also graced book covers, company logos, and art gallery walls. Matthew Atchley was ranked in 4th place in an international poll for Best Portrait Artist by the Spacie Awards. Matthew has also recently returned to his acting roots as well! He can be seen on episodes of “The Originals”, “Nashville”, “Snapped”, and “Murder Calls”, as well as many more upcoming projects. His entire artwork portfolio can be found online, at artofmatthewatchley.com and Facebook.com/theartofmatthewatchley.com. 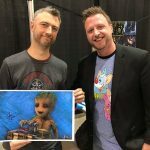 You can see all of his original art work alongside other comic book and indie artists this November 23-25, 2018, at the NorthEast Comic Con & Collectibles Extravaganza at the Boxboro Regency Hotel. Meet actors, performers, musicians, cosplayers, and creators at the holiday shopping event for nerds, and people who love them. Hotels rooms are available at a discounted rate until September 1, 2018, using the code COMC. Take part in Cosplay contests, celebrity and artist panels, and more! Free parking, and guaranteed not boring!